These interesting Facts about The Country Georgia will give you knowledge and information to know more about it. Georgia is a country located in the Caucasus region of Eurasia. It is a member of the Council of Europe and the GUAM Organization for Democracy and Economic Development. Below are some details facts about Georgia Country. Georgia is an exonym which is used in the West since the medieval period. It is believed come from Middle Persian varkâna means “land of wolves”. The name was etymologized as referring to St. George because of Georgians’ special reverence for that saint. 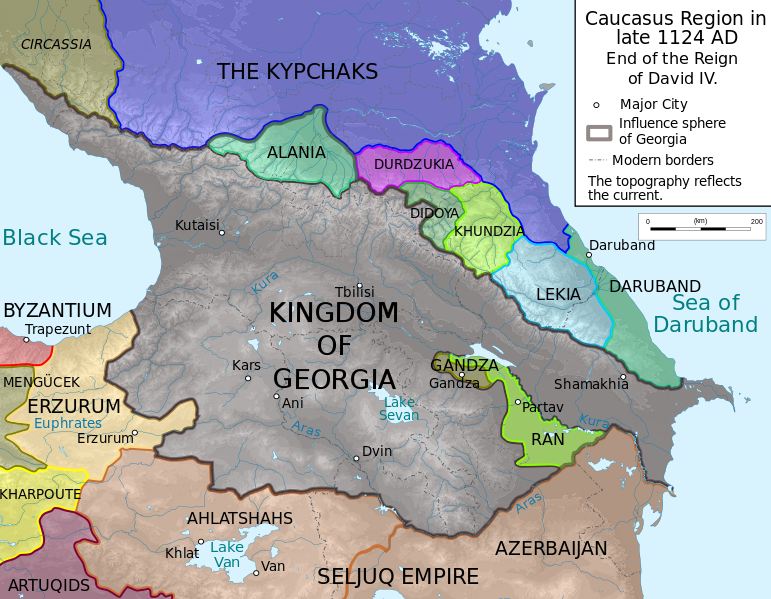 Georgia was part of the Khazar Empire during three centuries. At the beginning of 11th century, its various independent regions united into a single Georgian Kingdom. The official language of Georgia is Georgian. In percentage, the citizens of Georgia speak 71% Georgian, 9% Russian, 7% Armenian, 6% Azerbaijan and 7% other. The Georgian Armed Forces (GAF) is the name of the military of Georgia. It is organized into land and air forces. Here, Georgia sent around 1000 soldiers to the NATO-led International Security Assistance Force in Afghanistan. It makes Georgia has the highest troop contributor per-capita to the mission. Interesting incident happened in 2005; President Mikhail Saakashvili fired the entire traffic police force of the Georgian National Police. Around 30,000 police officers were fired because of corruption. 84 % of Georgia’s current population is formed by ethnic Georgians. Their official language is Georgian. Based on 2006 statistics, Turkey and China are the most immigrants in Georgia. One of the world’s most ancient Christian Churches is located in Georgia. Its name is the Georgian Orthodox Church which claims apostolic foundation by Saint Andrew. According to 2002 statistic, Georgian practices 83.9 % Orthodox Christianity, 9.9% Muslims, 3.9% Armenian Christians and 0.8% Roman Catholics. Rich folklore, unique traditional music, theatre, cinema and art formed Georgia as a country which has rich culture. They are well known for their love of music, dance, theatre and cinema. Rugby union is one of the most popular sports in Georgia. Football, basketball, wrestling, judo and weightlifting are the lists of the popular sports there. In addition, Georgia has the first and only race circuit which satisfies FIA named Rustavi International Motorpark. Khinkali (meat dumplings) has become particular dish of Georgia. Khinkali comes from eastern mountainous Georgia. Georgian has unusual traditions of dining called Supra or Georgian table. It is a way of socializing with friends and family. Hopefully these interesting Facts about The Country Georgia will enrich your sources of reading.